Ham and Eggs is one of the ultra-classic routes of the Alaska Range, providing a direct line to this popular summit. The climbing is fun and moderate, and it gives the feel of a big Alaskan alpine route. 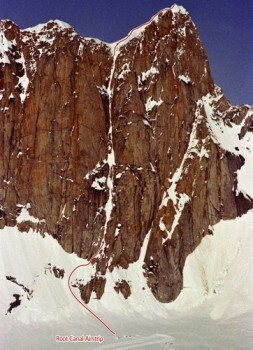 The climb is characterized by many short crux ice and rock sections connected by easier snow climbing. The corniced ridge to the summit is mellow by Alaskan standards, but can still be attention-getting at times. The views from the summit are truly awe-inspiring: a commanding view of the Ruth Gorge, Denali, Hunter, Huntington, the northern peaks, and the gnarly “Tooth” peaks adjoining the Mooses Tooth. Oddly enough, the route took over 20 years to see a second ascent in the late 1990’s, but it became a trade route almost overnight when Paul Roderick of Talkeetna Air Taxi started depositing climbers directly at its base. Now with its five-minute approach, this is a relatively safe and non-committing climb to test your Alaskan alpine skills. Which SuperTopo guidebooks include a topo for Ham and Eggs?